Want to pay more for a projector than you planned on? Does anyone? Of course not! Here’s the top 3 things people forget to consider when buying a projector that, if taken into consideration, will help you save money over the life of your projector. This applies to any type of projector or use – whether it’s for a home theater, a business or classroom, a large venue or any other use. Did you know that individual lamp costs can range from $250 up to $10,000 (for large venue projectors)? Older projector lamps generally lasted between 1,000 – 2,000 hours. 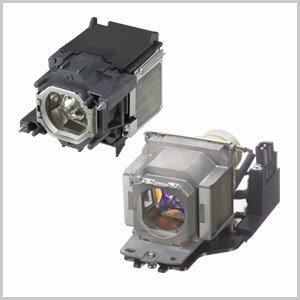 Fortunately, more recent projector lamps last between 2,000 – 4,000 hours depending on the various settings used in an environment. Even though lamp life is improving, filters still need to be cleaned or replaced, and lamps will eventually need to be replaced if the projector will still be in use. 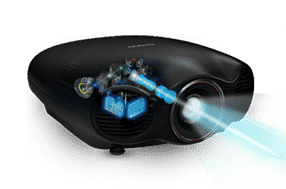 Newer projector technologies, however, either help expand a projector’s life span or completely eliminate the use of a lamp (and filter) altogether. All of these newer technologies have a life span of 20,000 hours or more! Either way, with these new technologies, there’s less maintenance and cost! So no matter which of the newer technologies is chosen, with these new technologies, there’s less maintenance and cost! Did you know that most projector warranties do not cover replacement lamps or lamp life? Extended Warranties – Many manufacturers offer extended warranties for additional costs. Or, if the manufacturer does not, the dealer where you purchase it from might. Other options may be available – make sure to investigate! Tip: If you purchase from an authorized dealer it is easiest to fulfill a warranty request or need – if you don’t, there is a chance the warranty may be invalid. In addition, a local dealer closer to you can likely help remedy an issue quicker. You know how most projectors ask to verify whether or not you want to turn it off before it will actually shut off? It’s because conventional projectors must allow their lamps to cool down before cutting the power. Additionally, you’ve probably noticed that most projectors take a moment while the lamp warms up to its regular brightness. The newer LED, laser, or hybrid projectors, because they use different light source technology, don’t require the normal power that it takes to ‘warm up’ or ‘cool down’ – which, as an extra bonus, makes turning it on and off much quicker! Just a quick comparison, but Sony mentioned it generally takes about one full minute for a lamp to warm up whereas it takes about six seconds for their laser projector to be ready for a presentation. In addition, because the newer technologies don’t use typical lamps, they run much cooler than conventional projectors. It’s similar to how conventional light bulbs have evolved. We used to have 60W incandescent light bulbs (and some may still use or have some hiding away somewhere), which produced maybe 1000 hours of light – and they could get extremely hot while on! Eventually those evolved to halogen, CFL, and now LED light bulbs – where a 12W LED light bulb, which produces similar light to a 60W incandescent light bulb, consumes less power, lasts up to 25,000 hours, and doesn’t burn your hand if you touch it while it is on. How’s that in comparison? Unfortunately, in general, the newer technology projectors cost more up front. But most don’t factor in the energy efficiency (or lack thereof) or the cost of maintenance when looking at and choosing the perfect projector. Don’t go off specs and technology alone. Specs can be deceiving – especially if they are not understood properly. Each environment is different. Ambient light, the size of the projected image, distance to screen, and projector screen type or material are all important factors to consider. For example, you may not need the brightest projector available if you’re projecting in a room that has little or no ambient light or windows. In addition to environmental considerations, your individual needs will be different than someone else’s. Are you willing to pay less for a projector that will consume more energy where replacement parts cost higher? The best way to interpret the technology and specs, and to help determine what might be best for you, is to speak to a specialist and see live side-by-side comparisons. Ted Bollinger has been in the professional display and electronic imaging industry for over 40 years. He has worked with and consulted with most major manufacturers' engineering representatives of professional and consumer flat screen TVs and projectors. He is currently with TVS Pro and serves as the manager for professional display products. This entry was posted in AV Solutions, Home Theater and tagged best projector, best projectors, digital projector, dlp projector, laser light projector, laser projector, lcd projector, led projector, projector, projector bulbs, projector lamps, Projectors, video projector.